I realized yesterday that I turn 27 in two months. Twenty-seven seems like an incredibly big number. That’s definitely out of the mid-twenties, and it’s definitely closer to 30 than I’m used to contemplating. People who are 27, in my rather skewed view of the world, have their lives together. Considering that I now have less than two months until July 10, I have started keeping records and making lists. I have an act to get together. It’s funny, how quickly this urge to organize my life came on me. Like many of my decisions, it happened in fits and starts, with plenty of melodrama. I think I spent an entire weekend alternating between feeling frustrated at easily fixable things and furiously congratulating myself for solving all my problems in one glorious sitting. This is not to say that there’s been no progress, that I set my goals too high and have given up on all of them. I’m actually pretty pleased with how well I’ve been sticking to the goals I’ve set. One new development has been my slow integration of a regular workout schedule. I’ve had many friends do Couch to 5K over the years. It’s worked for some and not for others. It turns out I love it. I’ve had a longstanding antipathy to organized exercise. The reasons are, by and large, irrational, but all the same, I’ve never belonged to a gym and I haven’t been on an athletic team since middle school summer league softball. When the weather started getting nicer, or at least bearable, I made my first attempts, supremely confident in my own overall fitness. Ha. That was a fun start! Lesson in humility: learned. Through the power of perverse persistence, though, I’ve started to get tastes of the legendary runner’s high. It’s a nice reward in and of itself, but it’s also nice not to feel so reactive. Somewhere in one of the creative writing blogs I follow, someone made the observation that the Sears Tower didn’t spring up fully formed all at once: all sorts of little rivets and bolts had to come together, and that huge building is the result of many small actions that accumulated over time. That could be the wisdom of the ages talking: people over the age of 27 surely understand that and go through life perfectly in control of their world. 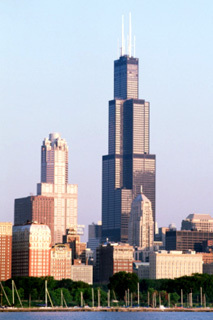 Being an adult is absolutely just like being the Sears Tower. Well. I’ve got two months to get my routine straightened out. If anything comes up, no worries: it goes straight to my book of lists.